Sixth symphonies are the theme here in a release comprising works written forty-five years apart and in recordings captured at live concerts. After his denunciation by the Soviet authorities, Shostakovich restored his reputation with his Fifth Symphony. At first Shostakovich was unsure how to follow its great success and concentrated on other works such as film scores and the Suite No. 2 for Jazz Band. 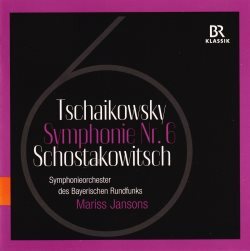 Written in 1939 during the insecurities of an intense phase of Stalinist tyranny the Sixth Symphony is quite a contrast to its predecessor. In it Shostakovich promised he would “express moods of spring, of happiness and youth.” It was Evgeny Mravinsky who introduced it with the Leningrad Philharmonic Orchestra the same year in Leningrad. Right from the opening bars of the substantial first movement Largo Jansons with a spaciousness that creates a spine-chilling sense of desolation. There’s a tremendous energy to the central Allegro as well as a mood of good humour. This never quite feels genuine owing to an undercurrent of tension. In the Finale I was struck by the explosive power growing out of smaller ideas. A sense of risk-taking is present in the writing as well as some highly memorable melodies. Especially noticeable in this case are the well-sprung rhythms in this lively and engaging playing. Rather than a predictably triumphant ending Shostakovich offers a touch of ambivalence. The Symphonieorchester des Bayerischen Rundfunks under Mariss Jansons is in quite excellent form and can stand alongside my two established recommendations. There is the gripping 1983 Amsterdam account from the Concertgebouw under Bernard Haitink. Secondly the passionately committed playing of the Royal Liverpool Philharmonic Orchestra under Vasily Petrenko recorded in 2009 on Naxos. Universally known as the Pathétique, Tchaikovsky’s Sixth is his most deeply moving and profound work. Once again the struggle against fate is central to a work which was to be Tchaikovsky’s last. The première took place in October 1893 in Saint Petersburg and just eight days later the composer was dead. Few musical farewells to the world are more affecting. In the opening movement I was struck by the marvellously crisp and engaging playing. Jansons resists the temptation to wallow and there is a gloriously temperamental power to the Allegro non troppo that feels as if it might explode at any moment. From beginning to end the Allegro con grazia is nimble and rhythmic with all the dreamlike elegance of a Viennese waltz. The superbly played Scherzo has an infectious and quasi-martial quality. When Jansons releases the full power of the orchestra the effect is compellingly dramatic. It’s remarkable how Tchaikovsky manages to close the symphony with a slow movement: a cry of anguish probably unequalled in the history of music. Jansons and his Bavarian players bring out a maelstrom of emotions that can leave the listener shattered. This is a thrilling performance of the Pathétique Symphony that joins the very finest. Nevertheless I wouldn’t wish to replace the opulently dramatic Gergiev and the Vienna Philharmonic Orchestra, recorded in 2004 at the Musikverein, Vienna on Philips. Of the older recordings I have great admiration for the compelling 1956 Vienna Konzerthaus account in mono by the Leningrad Philharmonic Orchestra under Evgeny Mravinsky on Deutsche Grammophon. Credit is due to the engineers for providing such splendidly consistent sound quality across the two locations. Applause has been left in but there is virtually nothing in the way of extraneous sound. These highly desirable performances are amongst the greatest committed to disc.